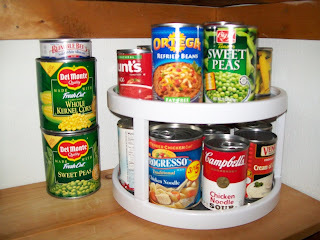 Frugal & Fabulous: Tackle it Tuesday: Can Carousel! Tackle it Tuesday: Can Carousel! Organize, organize, organize & simplify, simplify, simply. That's how I've been feeling lately! So remember a few months back when I posted about my messy pantry ? Well I kept looking at my cans and thinking I had no way of knowing what I actually had. Then I saw this little beauty at Bed Bath & Beyond for $12.99 (- a %20 off coupon, natch!) and I am in love!!! GREAT MINDS THINK A LIKE! cute! I have the same items that I got free from amazon (after my gc that I earned from CC) plus a step storage , I just need to make some time and add them to my spice cabinet! WISH ME LUCK! I will blog it once I have them done ......stay tuned!